In June this year I had the pleasure of my very first civil partnerships, when I initially met Nicky & Natalie I knew we would get on. I became very close to them as we had the same sense of humour and we have continued to stay in touch. An intimate wedding ceremony with close friends and family with a larger party in the evening. A big emphasis on flowers and styling (Natalie) and music and lighting (Nicky). They knew they wanted local and organic food where at all possible. They wanted ‘tradition with a twist’& ‘luxury but not glitzy’. When working on their design I wanted to choose a fairly modern and fresh colour scheme that would work well in a rustic barn and thankfully when I suggested apple green & plum they were delighted. 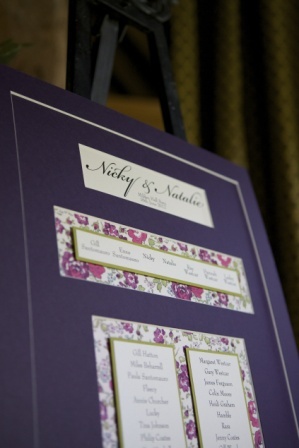 We were able to get permission from Liberty fabrics to use one of their designs, this was scanned and used on all stationery and subsequently the colours were used for the design palette for the reception. We even draped some of this fabric over the old arm chairs by the log burner to create a cosy area to relax. 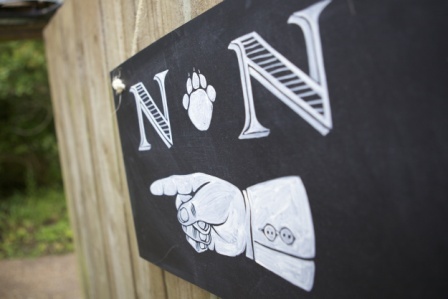 In addition we also incorporated a dog paw into the days design as my clients have many pets and their Labrador was the ‘best dog’! 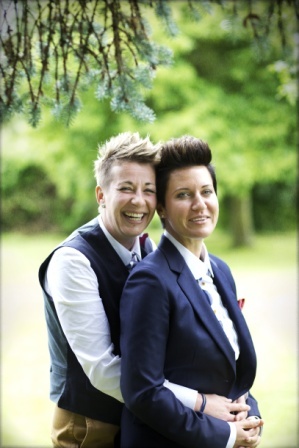 The original plan was to have a civil partnership ceremony but we were unable to book a registrar on the date we wanted. After discussing some options with my clients we decided on an intimate ceremony at the registrar office on the Friday with their witnesses and parents. On the Saturday we had a Humanist ceremony conducted in the garden by celebrant Linda Morgan. 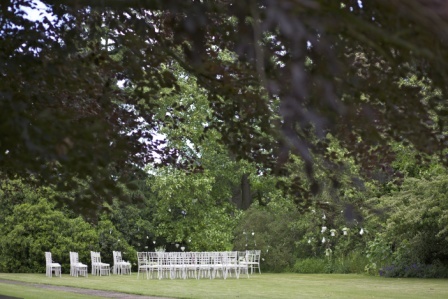 We were determined to have the ceremony outside by a stunning tulip tree and were fortunate with the weather. It was touch and go but I’m so pleased we were able to give Nicky & Natalie the garden ceremony they desired. Thankfully the rain held off (just) albeit it was a tad windy so some of the design details planned for the ceremony area had to be ditched. 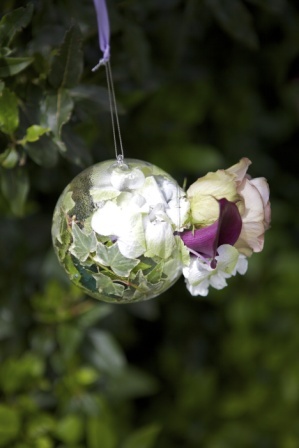 We did still manage to tie Perspex balls and buckets of flowers to the tree although they did bash about a bit! Both fathers walked their daughters down the aisle and Natalie’s sister was a bridesmaid whilst their dog Hatty was the ‘best dog & ring-bearer’. His bed was under the tree so he could nap during the ceremony! 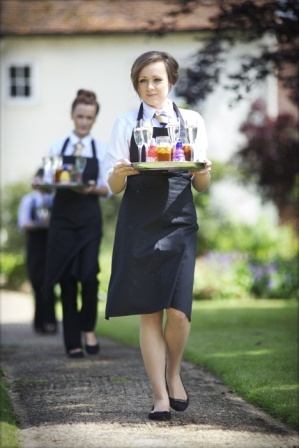 The drink reception was held in the garden with champagne and canapes and fruit shoots for the children! Sax and Honey continued to play relaxing background music. Whilst this was taking place Lisa and I re-positioned the buckets of flowers to the courtyard area and inside the barn, I’m a big believer in getting dual uses out of flower displays if possible!